Some restaurants come and go, others stay the course (for better or worse), and then there are places like Osteria La Buca. A Hollywood neighborhood staple since 2004, La Buca has gone from a 20-seat charmer with Mamma at the helm (she and son Filipo Cortivo now have Osteria Mamma a few blocks away) to an airy Cal-Ital spot where studio lunches and cozy dinners are the norm. And while every few years it seems to reinvent itself via facelifts, cocktail programs and chefs, the name has stayed the same. 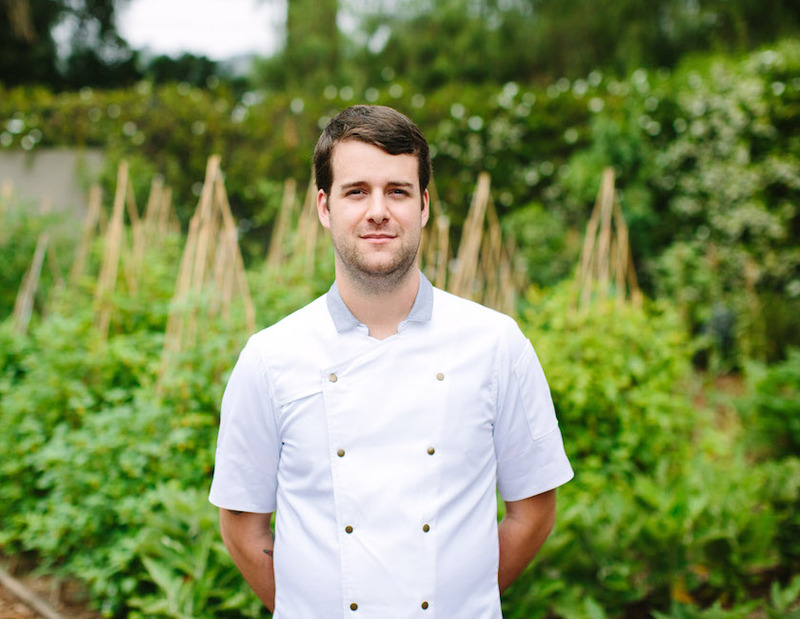 And once again there’s a new story to tell by way of Cameron Slaugh, the new chef shaking things up in the kitchen. While Slaugh has a pretty impressive resume, which includes stints at Alinea in Chicago and Eleven Madison Park in New York, he grew up in rural Utah where his family raised everything from produce to poultry. That background goes hand in hand with a new farm La Buca owners Stephen Sakulsky and John Moezzi commissioned in West L.A. of all places, where they’re growing everything from squashes to tomatoes, lettuces, chilies, and more for the menu. The land, a former home that the family wanted to turn into a farm, also has an orchard and berry bushes. “It’s a mix of things that you can and can’t really find out here at the markets,” the chef says. “I’m already planting the autumn production; definitely things like sunchokes, gourds, salsify, and cabbages.” All of this is showing up in new dishes across the board. That means the handmade pastas and pizzas are still available, but with his spin, from wheat conchigale with fresh squash and tomatoes bigoli en brodo with house pancetta and poached egg. He’s added things like housemade ricotta with caramelized agave and toasted bread; salads with Buca Farm lettuces, melons and leeks; and grilled octopus with avocado, fennel and pistachio vinaigrette. The restaurant also now serves brunch on Sundays, and the menu is all Slaugh’s, things like sautéed farro with poached egg, arugula, sausage and pecorino; polenta-ricotta skillet cake with Meyer lemon jam and honey; baked eggs in spicy tomato sauce with goat cheese toast; and a pressed porchetta sandwich with poblano sauce. Check out the new menus at lunch (Monday through Friday, 11:30am-2:30 p.m.), dinner (beginning at 6 p.m. Monday through Friday, and 5 p.m. on Saturdays and Sundays), and brunch (Sundays, 10:30 a.m.-2:30 p.m.). The bar stays open late on the weekends.